What happens if we reject this contract? One of the key questions facing rank and file UFT members at this moment is what happens if we decide to reject the contract proposal from Mayor de Blasio and our leadership. 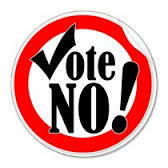 Few educators are jumping up and down happy about the contract, and many are downright upset, but everyone wants to know – What happens if we vote this down? Is it possible to get something better? What about the leadership’s argument that we would have to “go to the back of the line” and wait for all 150 other city unions to settle? 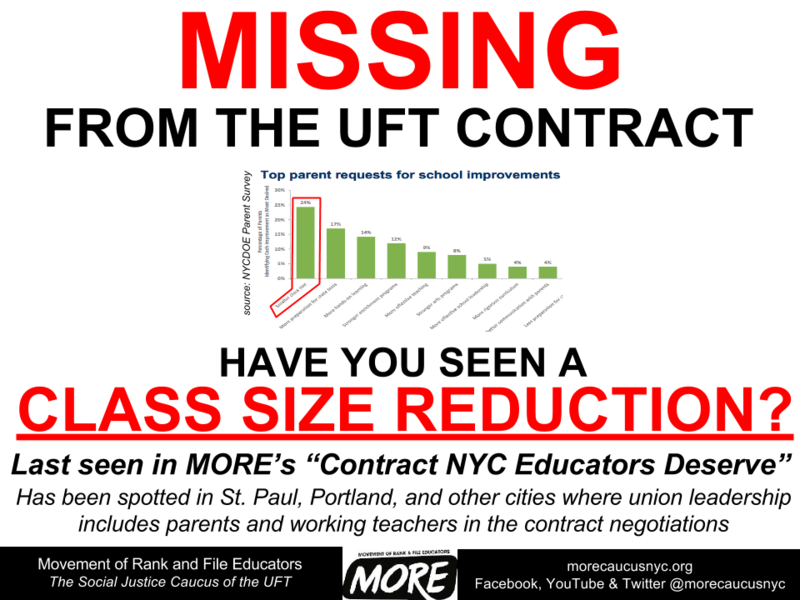 Lest we forget, the UFT leadership works for the membership- NOT the other way around. Our dues pay for their salaries, their perks, and the UFT skyscraper at 52 Broadway. Our COPE money buys the “seat at the table” with the politicians, billionaires, and power brokers they say will save our profession. They push a TINA (There Is No Alternative) mentality on the membership, and when it comes to the 2014 contract, operatives (belonging to the UNITY caucus that has monopolized power within the UFT since its founding in 1960) have been sent out among the membership. Their message is that this proposal is the best we can do, so even if you have lots of problems with it, it’s better than no contract at all, so you might as well vote “yes”. Let’s say you sat down at a table, ordered, and were served a dish that looked, smelled, and tasted awful. Would you choke it down because that’s what you had been brought? Since you are paying the restaurant for the sole purpose of preparing you a tasty meal, most people would send it back and expect the restaurant to replace it with something better. What if everyone’s meal was unacceptable, and the manager sent around the maitre d’ to explain to each table that the restaurant’s suppliers sold substandard meat and produce, so there was no way they could produce a tastier meal, but that surely, eating what they had brought you was better than no meal at all? UFT members and the children we serve have suffered over the last several years due to deteriorating learning and working conditions. The proposed new UFT contract highlights this administration’s commitment to the restoration of collaboration and communication between our union and the city. It is a welcome departure from the previous administration. The proposed contract includes some steps forward in rebuilding respect for educators, voices of parents, and open dialogue between the city and its workers. There are changes in this proposed contract that will improve our students’ learning conditions and our working conditions. I have serious concerns, however, with several aspects of this proposal that undermine the importance of solidarity, that fall short of bringing us closer to the schools our students deserve, and that bring into question our value as workers. The proposed contract will divide educators into several tiers. Once we destroy union solidarity, we destroy our union. Career ladders are nothing more than a merit pay scheme with a different name. The only incentive given here is for great teachers to leave the classroom, which is not a plan for long term school progress. Teacher leadership is critical to the success of schools, but dividing teachers by salary is not a way to achieve this goal. Due process, job security, and fair evaluations for all educators are the foundations of any teacher’s union contract. There cannot be two sets of rules for educators. 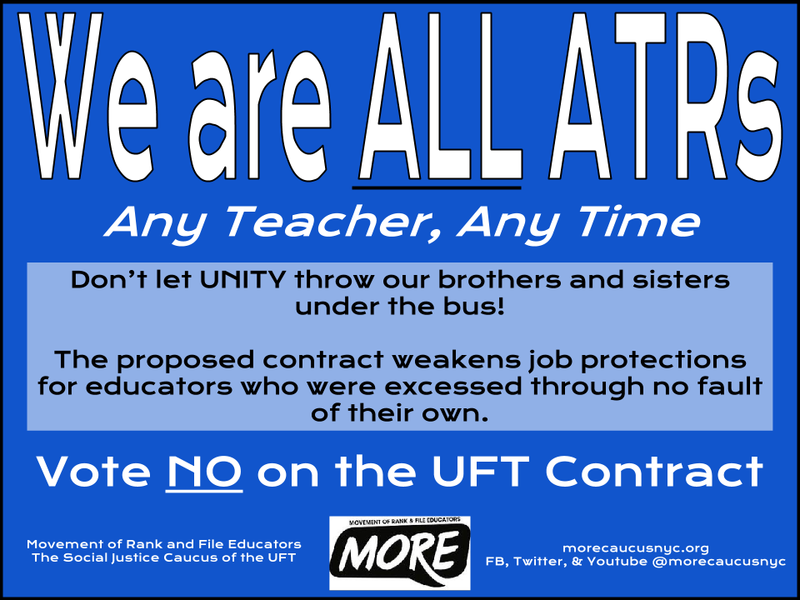 Those who were excessed through no fault of their own and were placed in the Absent Teacher Reserve (ATR) pool should not be held to a different standard than their fellow union members. I also hoped this contract would address pay parity. Occupational and Physical Therapists, who are essential to the success of the children we serve, make considerably less than their educator colleagues. Paraprofessionals also deserve consideration in this contract, as they are underpaid for the important and challenging work they do. This proposal is a missed opportunity to improve the relationships with the communities we serve. I applaud the increased time for parent and teacher collaboration, but this step does not go far enough in advancing the policy issues that parents, educators, and our students are most concerned about. I hoped this contract would go further in addressing issues of class size, developmentally inappropriate standards, lack of robust curriculum, targeted intervention for students, art instruction, too-large caseloads for counselors, psychologists, and social workers, over emphasis on high stakes testing, the deficit of resources for special needs children, and the continued reliance on flawed test based evaluation. While I commend the effort to address the needs in hard-to-staff schools, I believe a different path should be taken. Wraparound services, reduced class size, additional nurses, librarians, social workers, counselors, healthy food initiatives, after-school and weekend academic programs, and extracurricular activities are all proven formulas for success, not $5,000 bonus pay. Simply, I feel this money would have been better spent on direct services to children. I also commend the additional time for educators to work in teacher teams, engage in meaningful professional development, and complete the monumental tasks that we frankly do not currently have the time to complete. However, I am concerned that this time that has been reconfigured to support teachers leaves our children behind, because, with the information I have seen thus far, there will be no efforts to replace targeted intervention for students. School Leadership Teams (SLTs), which consist of administrators, teachers, parents, and students at the high school level, should be empowered to make authentic decisions for their schools. While I appreciate what I believe is the good intention behind the PROSE School Initiative, I am concerned about the possibility of “thin contracts” and the inherent acceptance of the assumption that the union contract and Chancellor Regulations have a negative impact on schools. I would have rather seen these efforts directed at strengthening SLTs in all schools. UFT members are dedicated professionals, and although we didn’t become educators for the money, we do have families to raise and financial obligations that have become more difficult over the past five years. I am a teacher, a wife, a mother, and a New Yorker; I want to live where I work and provide my son with every opportunity. I do my part to improve our schools and society for him, for all children, and for their families. This proposed contract would have members accept raises that are less than two percent each year between 2009 – 2018, less than the rate of inflation. Salaries around the country have fallen behind, which has caused income inequality for many families of the children we serve. Every working man and woman deserves a living wage and annual cost of living increases. If our union does not take this stand, who will? Our friends in virtually every other municipal labor union received the wage increases they deserved nearly five years ago. Today they continue to have the full 8% as part of their salary scale, even though most now also find themselves with expired contracts. UFT members will not receive these wage increases with retro-pay until 2020. In September, UFT members will walk into a 2% raise and $1,000 rather than the 8% we deserve. 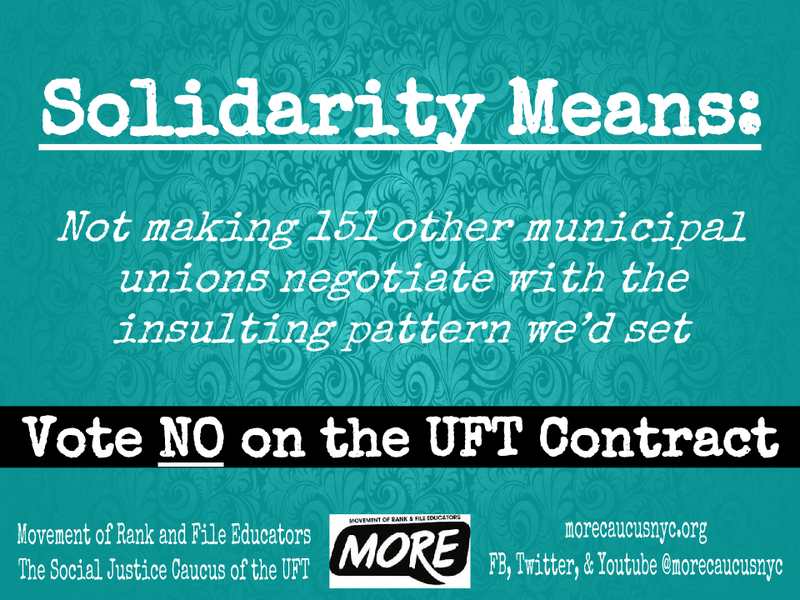 If we accept this deal, other union members may be forced to accept similar bad contracts. This proposed contract sets a dangerous precedent. Politicians now have the green light to refuse to negotiate in good faith and force pay freezes for workers, 0% pay raises, deferred raises and retro-pay and a contract that is below the rate of inflation. 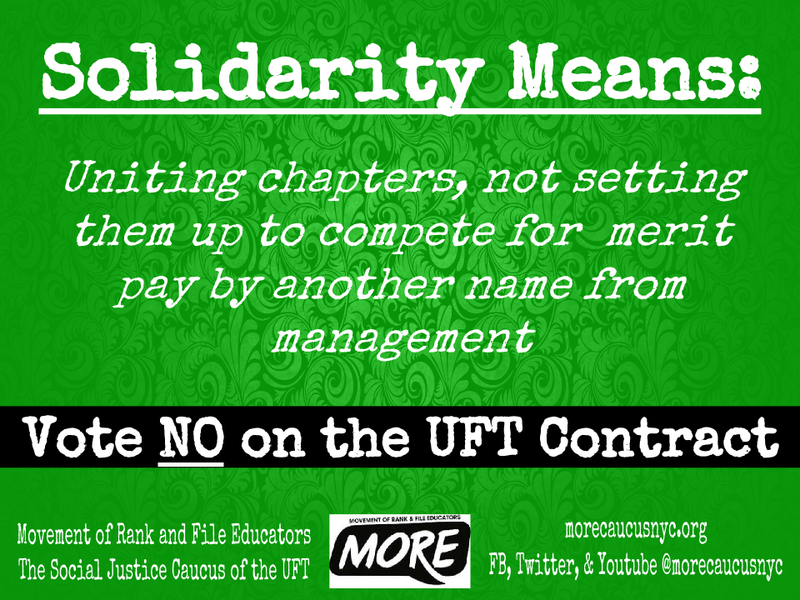 UFT members have been without a contract for over five years. We, along with the communities we serve, have faced a tidal wave of attacks on our neighborhood schools. A new contract has the power to right these wrongs. I believe the path to real change must be traveled together. Only through the active involvement of our members, parents, and with respect for all students, can we achieve the promise of public education and the schools our children deserve. Many teachers I know, and my amazing colleagues at PS 15, would have happily conceded some financial compensation in favor of a greater improvement to teaching and learning conditions. Given that this contract extends beyond the next Mayoral election, we have surrendered vast opportunities for meaningful improvements and progressive “reform”. I encourage school communities in the coming days and weeks to have collective, open and transparent discussions in their chapters, during lunch, and with their families, the kind of conversations we should be having in our union hall, to reach an informed decision on members’ ratification vote.